Perched on the East Coast of the North Island of New Zealand, Gisborne is a place of rich history, beautiful uncrowded beaches, and legendary wines. You might also say it’s a city of firsts. It is where the first Māori migratory canoes landed, where British explorer Captain James Cook first came ashore on Kaiti Beach in 1769, and, since it’s also the most easterly point in the world, it is the first city in the world to see the sun rise each day. Gisborne, or Gizzy as it’s affectionately known, is a vibrant town with unique buildings and shops full of New Zealand culture and life, and great photo opportunities such as the Town Clock and the Te Tauihu Turanga Whakamana, a large contemporary sculpture that celebrates early Māori explorers. 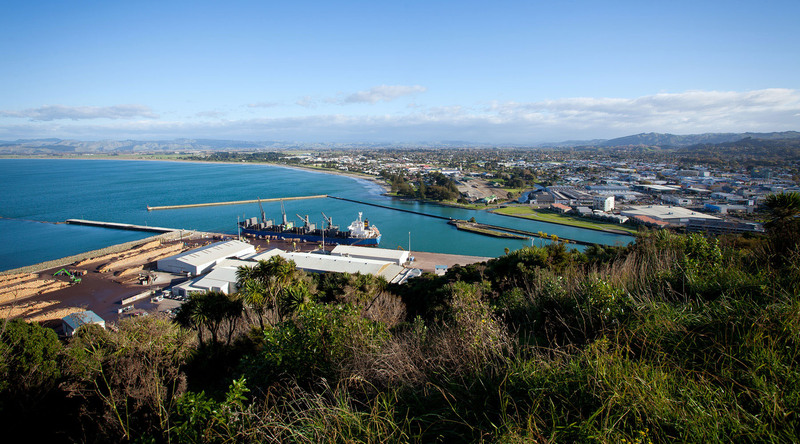 You’ll find a profound amount of Māori culture and history in Gisborne, due in part to its large Māori population— 48.9% —well above to the national average of 14.9%. The incredible beaches in the Gisborne area may be best known for surfing, but you don’t need to catch a legendary wave to enjoy them. Watch the sun rise high over the Pacific Ocean at Gisborne Beach or perhaps do some walking, swimming, surfing, fishing and horseback riding at Wainui Beach, recommended by locals. Snorkel, swim with, and even feed stingrays out on the reef at Tatapouri or venture to majestic 660-meter-long Tolaga Bay Wharf for some fishing and an incredible view. Beautiful and remote, Gisborne is a little less explored and a little less well known than other cities, so you can be among the first to discover its charms. Known as Tairawhiti, the light shines on the water, and it does seem like the sun is always shining on Gisborne. This award-winning museum and art gallery is widely known as one of the best, most innovative museums in New Zealand. Take in the region's history, art, and taonga Māori (artefacts) through a variety of galleries, rotating exhibits, unique displays, and even a vintage surfboard collection. Grab a souvenir to take home at the shop or stop for a coffee at the cafe to keep you going. Enjoy a peaceful retreat to New Zealand’s national arboretum. The more than 135 beautiful hectares are home to an incredible variety of native and exotic trees (more than 25,000 species), the largest collection of exotic trees in the Southern Hemisphere. It’s also a welcome sanctuary for a huge variety of birdlife. Walk a trail and find the perfect picnic spot, or tour in an open-backed jeep. Thanks to some of the best weather in New Zealand, Gisborne is an important grape growing region, the unofficial Chardonnay Capital of New Zealand, and home to some of the most acclaimed winemakers in the country. Enjoy a delicious range of wines and beautiful harbor views at the Gisborne Wine Centre. Then hit the wine trail to visit boutique wineries, sampling world-class varietals—Chardonnay, Gewurztraminer, Viognier, Pinot Gris, Merlot, and Malbec—along the way. Visit a 2,100-acre New Zealand sheep farming station to connect with a local family happy to share their home, farm and hospitality with new friends. Sip and savor your way through New Zealand fabled Gisborne wine country on an excursion that visits two of the region’s most renowned vineyards. Tee it up on one of New Zealand's premier golf courses, the championship holes of the seaside Poverty Bay Golf Course.